An estimated 1 billion people do not have access to clean drinking water, a problem expected to worsen with climate change, according to the World Health Organization. In addition, higher energy needs and increased use of heavy metals in industrial processes have increased human exposure to these toxic materials from drinking water in recent decades. Researchers now report in ACS Central Science a new material that can remove heavy metals and provide clean drinking water in seconds. There are many sources of exposure to toxic heavy metals. Lead, in particular, has been used in paints, ceramic glazes, jewelry, toys and in pipes. Current commercial methods to remove heavy metals including lead from municipal drinking water can be expensive in terms of money and energy and are inefficient. In addition, some current approaches either are single-use, are difficult to regenerate or can produce significant toxic waste as a side product. Wendy L. Queen and colleagues sought to attack this issue with materials called metal organic frameworks (MOFs) that are networks of organic chemical 'struts' with metal nodes known to pull things like water and gases from air. 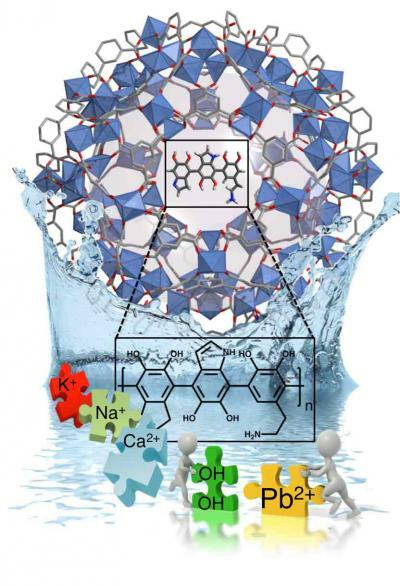 That ability, plus the large surface area and chemical tunability of MOFs make them a promising material to remove heavy metals selectively from water. The researchers created a water-stable MOF/polymer composite with cheap, environmentally and biologically friendly materials and tested its ability to remove heavy metals from water. It had one of the highest reported removal capacities to date, removing over 1.6 times its own weight of mercury and 40 percent of its weight in lead. The researchers tested the MOFs in solutions with lead levels similar to those found in contaminated water samples from Flint, Michigan. They found that the material can rapidly reduce lead concentrations to 2 parts per billion, which is the U.S. Environmental Protection Agency limit for drinkable levels. Further, the authors removed lead from various real-world water samples from the Rhone River, the Mediterranean Sea and a wastewater treatment plant in Switzerland. The researchers also demonstrated how the material could be regenerated easily without toxic products. The authors say they are now pursuing using other specially designed MOFs to remove other trace contaminants in water. The authors acknowledge funding from the Swiss National Science Foundation, the German Research Foundation, the Department of Energy and the Swiss National Supercomputing Center.